Racing Ahead is the title of my popular limited edition print showing three racing cyclists whose images overlap in brush strokes of deep red and purple to give the impression of motion and speed. 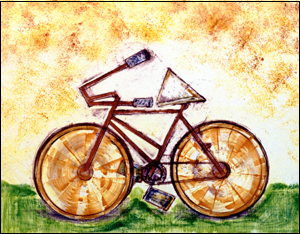 This design is the first of my bicycle series to be reproduced on gift items. Giclee available 32" x 12" on canvas, ready to hang. Limited edition giclee prints, signed and numbered by the artist are available for purchase. Image is 16.5"wide x 7" tall on museum quality archival paper. $175. Also available 32" x 19" on canvas, ready to hang.